Callinectes sapidus, the most famous American crab, has a natural range which extends down the eastern seaboard from Delaware Bay to Florida and beyond, but is mainly caught in the Chesapeake Bay area. […] These are handsome crabs, and their scientific name is suitably honorific. Callinectes means “beautiful swimmer” and sapidus means “tasty.” Warner [Beautiful Swimmers, 1976], whose admirable book has all the information one could desire about the blue crab and ways of catching it and the people who live by catching or dressing it, remarks that it was Dr. Mary J. Rathbun who gave it its specific name and that, although in her long career at the Smithsonian Institution she identified and described 998 new species of crab, this was the only instance in which she alluded to culinary quality. We’re in Urbanna at Carlos’s aunt and uncle’s place. We’re all fiercely chilled out. Life is good. The neighbors invite us over to eat some crab. 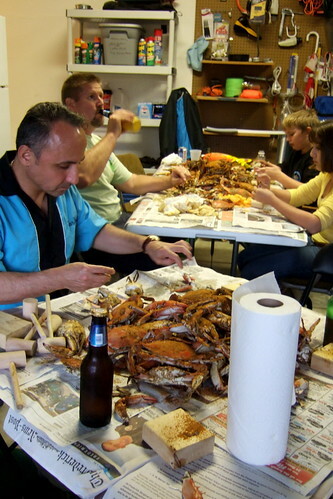 So off we go with cold beer: in the garage—suddenly a king’s banqueting hall—are tables piled high with blue crab. I have never seen so much crab fresh from the pot and free. We look at each other and back at the crabs. I love my husband, but at that one moment I really love that pile of crabs. It’s a mirage of Old Bay and sweet body meat. In the back of my mind I wonder about all the reports I’ve read about the blue crab populations, overfishing, global warming affecting the Chesapeake Bay seagrasses (where the post-larval crabs hide), and the collapse of the Bay’s fishing industries. As we’re smashing shells with wooden mallets and ripping bodies open, our host tells how he caught these himself in a crabpot. He answers questions about restrictions on size, throwing back the females, and the crabbing season. He gives us his secret crab steaming recipe. He seems quite knowledgable, law-abiding, and freakishly generous, so I just forget myself in the pile in front of me. A boatload of crabs argues for having on hand a large quantity of good, crisp, mild beer to allow the delicate crab flavor to shine through. A jelly jar of a quiet, fruity, more minerally Chardonnay (a Chablis, for example) or a Gavi would be terrific too. The blue crab is a bottom-dwelling creature that lives and breeds in a variety of nearshore habitats. The heart of the blue crab fishery was traditionally the Chesapeake Bay area, but now equal amounts come from the Carolina coast and the Gulf of Mexico. The blue crab has the potential to support a sustainable fishery due to its one- to two-year maturity period. The crabs are caught in traps that take little bycatch of other marine life. However, many blue crab populations have been on the decline, due to habitat loss caused by pollution and coastal development. In the Gulf of Mexico, shrimp trawlers take juvenile crabs as bycatch before they have the chance to mature and reproduce. More basic science regarding the blue crab population cycle is needed, and while Maryland/Virginia crab management is proactive, management of other domestic and international blue crab fisheries could be improved. 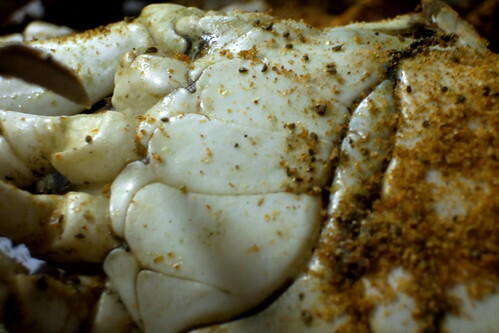 The various seafood watch sites give mixed reviews to eating blue crab. None discuss the ethics of an offering of hand-caught free crab (and beer) in the neighbor’s garage.